HOUSTON — The American Heart Association announced tonight that Clemson Head Coach Dabo Swinney has been named the recipient of the 2018 Paul "Bear" Bryant Award. Now in its 33rd year, the award recognizes the country’s top college football coach for his contributions both on and off the field. The award is selected after all bowl games have concluded and is voted on by the National Sports Media Association. ”You know it’s been a great year when you get invited to this event,” Swinney said prior to accepting the award at a ceremony in Houston on Wednesday evening. Swinney becomes the first three-time winner in the history of the Bear Bryant Award, having collected the honor following the 2015, 2016 and 2018 seasons. This season, he was one of seven finalists for the award, a group that included UAB's Bill Clark, UCF's Josh Heupel, Notre Dame's Brian Kelly, Army's Jeff Monken, Alabama's Nick Saban and Fresno State's Jeff Tedford. 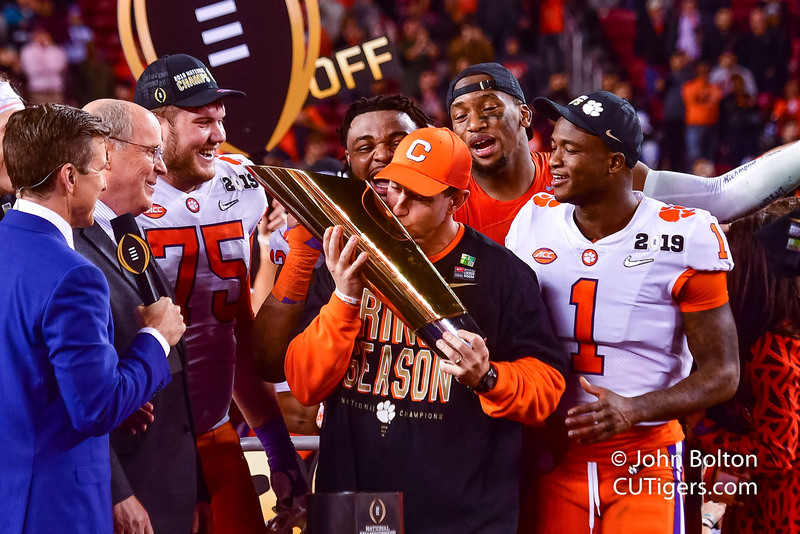 This season, Swinney guided Clemson to its third national championship in school history, the second in his tenure. He pushed his career record to 116-30 by leading the Tigers to the first 15-0 season in major college football in the modern era. In the process, Swinney defeated two fellow Bryant finalists – Kelly and Saban – by a combined score of 74-19 in the College Football Playoff in wins against No. 3 Notre Dame and No. 1 Alabama. Swinney concluded his acceptance speech by calling Woody McCorvey, Clemson’s Associate Athletic Director of Football Administration and Swinney’s former position coach at Alabama, to the stage to share in the honor. The award marks Swinney's third Coach of the Year honor this season and his second such national award. He earned the 2018 Woody Hayes Award from the Touchdown Club of Columbus and Coach of the Year from the ACC. He was a finalist for the Eddie Robinson Award and the Dodd Trophy in addition to being a semifinalist for the George Munger Coach of the Year Award.